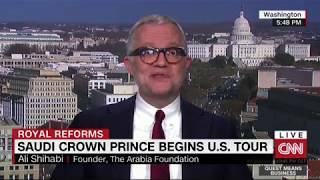 Crown Prince Mohammed bin Salman’s visit will focus on telling America’s leading companies that Saudi Arabia is “open for business.” He will meet with leaders in finance, technology, and entertainment, among others, in the hopes of encouraging them to invest in the Kingdom. Listing Aramco on the Saudi stock exchange (Tadawul) was always the Kingdom’s primary objective. If necessary, a secondary listing will follow later on. In terms of the political agenda, the crown prince is trying to communicate to the American people that Iran is an expansionist power, whose aggression is largely unchecked despite controlling four Arab capitals. The Trump Administration and Saudi Arabia are largely aligned on this issue. Despite being just one of several parties to the Yemen conflict, Saudi Arabia has been unfairly depicted as “owning” (in public relations terms) the humanitarian crisis. In the medium-term, the Kingdom’s ability to combat the Iran-backed Houthis in Yemen is much more sustainable than many outside observers think.